Yes, I'm hanging 5 stars on this out-of-the-way grocery, deli, gas station aka Oregon House Grocery & Deli. Employees and owner have hit this one right on the mark. We were ravenous by the time we arrived and the very local OHGD went above and beyond to satisfy our taste buds and tummies. We ordered deli sandwiches. Were they gourmet? Define gourmet. They were fresh. Made to order. First thing for any sandwich is the bread. Just you're basic sliced rye -- but it was exceedingly fresh and we all noticed. Two of us had the veggie -- adding cheese -- all the veggies were cold, crisp and (one more time) FRESH! All the extras pickles, onions. We snatched it down. Our third lunch guest had sliced turkey (yes, pressed) but was perfectly content with the results -- not a scrap left. While we waited for our lunch we explored and were amazed at what we discovered. Overlooking all the usual sodas and snack food, we found an amazing number of local/regional goods from wine, chocolate, fruits and veggies, We jumped on and bought loaves of local North Yuba Bakery bread -- that was a real treasure and another review coming up soon. Great chocolates and other taste-tempting treats. Local farms of North Yuba Grown should be part of this locavore adventure. One last thing: Staff was friendly. Sandwiches delivered timely. Now we were there well-after the lunch rush, but still need to acknowledge good service. When we inquired about other local products they were quick to respond and happily so. Good selection of local wines, beer, coffee, jerky, produce. Much of the store is given over to what you would expect in a rural destination such as this -- but they have clearly made an effort to support locavore, farm-to-fork mantras. I can only hope it continues. The back roads leading to Oregon House Grocery & Deli are a cyclist's dream. Along the way, make haste and get to this oasis of Visit Yuba-Sutter. FYI - Deli closes at 3pm. Grocery store is open until 8:30pm but I always recommend calling ahead. Despite being a bit on the remote side of life, prices were exceedingly reasonable -- three of us agreed. That said, one should expect slightly higher costs for places off the beaten trail. I am saying loud and proud to be Omni-local @ Oregon House, California! There is much to see and do in this unexplored corner of the Golden State. I'll get it done! You should, too! Yes, I'm hanging 5 stars on this out-of-the-way grocery, deli, gas station. For those who gave it three or less...shame on you! Maybe you hit them on a bad day -- your bad day. Anyone willing to operate a business in a remote and rural area deserves all our support. Of course, there may be some exceptions to that rule but in this case -- the employees/owner have hit this one right on the mark. Yes, we were ravenous by the time we arrived because all other food locations were closed that afternoon, but OHGD went above and beyond. We ordered deli sandwiches. Were they gourmet? Define gourmet. What they were was fresh. Made to order. First thing for any sandwich is the bread. Just you're basic sliced rye -- but it was exceedingly fresh and we all noticed. Two of us had the veggie -- adding cheese -- all the veggies were cold, crisp and (one more time) FRESH! All the extras pickles, onions. We snatched it down. Our third lunch guest had sliced turkey (yes, pressed) but was perfectly content with the results -- not a scrap left. While we waited for our lunch we explored and were amazed at what we discovered. Overlooking all the usual sodas and snack food, we found an amazing number of local/regional goods from wine, chocolate, fruits and veggies, We jumped on and bought loaves of local North Yuba Bakery bread -- that was a real treasure and another review coming up soon. Great chocolates and other taste-tempting treats. One last thing: Staff was friendly. Sandwiches delivered timely. Now we were there well-after the lunch rush, but still need to acknowledge good service. And also when we inquired about other local products they were quick to respond and happily so. The back roads leading to Oregon House Grocery & Deli are a cyclist's dream. And along the way, make haste and get to this oasis of Visit Yuba-Sutter. FYI - Deli closes at 3pm. Grocery store is open until 8:30pm but I always recommend calling ahead. California Swan Festival, November 2014, the journey started! Actually, the seed was planted years ago celebrating back roads, wildlife, agritourism and culture in quaint towns along highways 99 and 70 in Yuba and Sutter counties. Decisions to hike the smallest mountains and lose myself in the throngs of (possibly) the largest cultural event in California -- it didn't take much convincing. Last year's California Swan Festival, opened a new chapter for my California Omni-local passion -- this time inYuba-Sutter. Not my first destination forary to eat, sleep, drink, breathe, drive and become Omni Yuba-Sutter and most certainly not my last. Defined: Omni - all or everywhere; the whole; of every kind. Yes, Omni-local! I have been scouring my Thomas Bros California Road Atlas to begin finding all the roads I must discover. Shocking, I have no GPS! I challenge myself to get lost and find my way back. The best omni-local adventures happen this way. I plan, quite simply, to lose myself in Yuba-Sutter and to bring you along as I do. Just a scooch over 24 hours and my senses were revving. The images tell the whole story. Over time, I will tell you much more. If you have Yuba-Sutter secrets you'd like to share, please do! They're safe with me -- insert a smile and a wink here! Visit Yuba-Sutter 24-hour Adventure from Are You That Woman on Vimeo. Gone Fishing, is a major new program to introduce people of all ages, especially urban youth and children overly-focused on their digital devices, to fishing as a gateway to discovering the outdoors. Bass Pro Shops national program encompasses a variety of significant initiatives designed to introduce audiences that haven’t been exposed to outdoor recreation, and inspire experienced anglers to pledge their support and join the fishing movement this summer. “Fishing offers kids and kids-at-heart the opportunity to put down our devices and experience the outdoors together to bond with our families, connect with nature and get some exercise,” Lippelman said. “Gone Fishing” offers opportunities for people of all ages and skill levels to get involved. 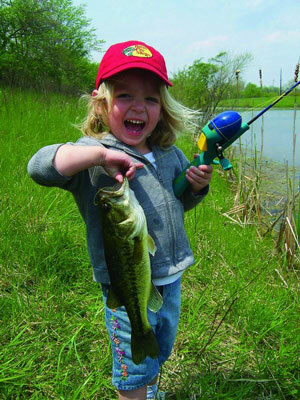 Free in-store events feature large catch-and-release ponds and will provide kids and families with the opportunity to catch their first fish, learn basic techniques or fine-tune their fishing skills. The free events aim to make fishing accessible through an easy and fun way to get started with how-to seminars, take-home handbooks, photo opportunity with downloads, certificates** to commemorate that first catch, and in-store giveaways. Trade in a video game for the “reel” deal Families can step away from their screens and commit to spending more time outdoors by trading a video game for their own fishing gear. 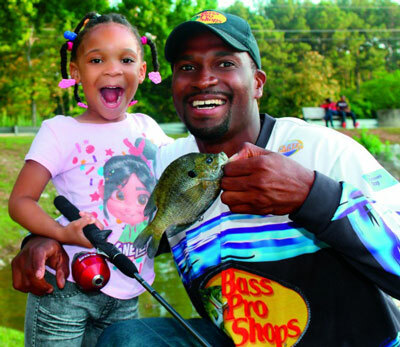 Shoppers can bring in a game at participating Bass Pro Shops stores in the U.S. on June 13, 14, 20 and 21, and receive a coupon for $5 off a new rod and reel combo costing $19.99 or more (limit one coupon per person). Experienced anglers are encouraged to join the movement by pledging to take a friend or family member fishing this summer. Beginning June 13 participants who pledge to share their love of fishing can enter online for a chance to win a fishing outing for 20 of their friends and a special guest celebrity. Take a #fishie (a selfie with your fish). Capture a photo of your catch for a good cause. If you catch a fish, whether it’s at a Bass Pro Shops catch-and-release ponds, or out in nature, take a #fishie (a selfie with your fish), share it on social media and challenge five of your friends to take a #fishie along with a donation to the Teach a Child to Fish program. Bass Pro Shops® specialize in outdoor fun. Bass Pro Shops stores, many of which feature restaurants, offer hunting, fishing, camping and other outdoor gear while their catalogs and website serve shoppers throughout the world. The company’s Tracker Marine Group®, manufactures and sells a variety of boats for fishing and cruising. Family fun is on tap at Bass Pro Shops resort Big Cedar Lodge®, voted by Travel + Leisure as one of the top 50 Best Hotels for Families in the U.S. For more information, visit www.BassPro.com and follow them on Facebook. To request a free catalog, call 1-800-BASS PRO.